Wells, Kristen M., M.P.H., Ph.D.
Kristen Wells is an environmental epidemiologist with a focus on the use of Geographic Information Systems (GIS) for estimating historic and current environmental exposures, spatial modeling of disease, and hierarchical regression modeling techniques. Within the Department of Public Health Sciences, she teaches courses in environmental epidemiology and intermediate epidemiologic methods. As a member of the Geo-health Interdisciplinary Research Group (GIRG), Dr. Wells is mapping the spatial distribution of cancer incidence, control and care in Virginia, with the goal of understanding the relationship between place and cancer in the state. 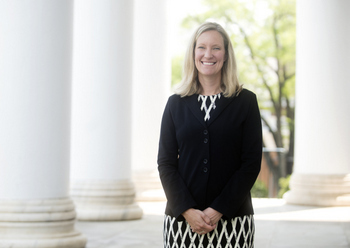 Additionally, she is the scholarship coordinator for the UVA School of Medicine’s Generalist Scholars Program, and teaches a graduate level introductory epidemiology course in the UVA School of Nursing.